I went there. Let's say that I do not take St. Patrick's Day lightly. This is a day for my Irish heritage to shine. (PS - I'm totally not Irish, but I will celebrate with those that are.) This is a time for celebration. This is a perfect excuse to bust out a batch of green velvet cupcakes. Green Velvet Cupcakes. As in Red Velvet Cupcakes with green food coloring instead of red food coloring. This isn't rocket science, but let's face it: I'm a sucker for pretty food. I'm also really into vibrant green colors right now so this was perfect for me. I've made red velvet cupcakes in the past, but each time I did they just ended up being too dry for my liking. I spoke to my co-worker who's a baking expert and she suggested I try the Martha Stewart recipe since it uses oil and would make the cake pretty moist. I initially balked (SAT-word alert!) at the amount of oil Martha called for, so I toned it down slightly and I was quite pleased with the outcome! I've said it before that I'm not a die-hard red velvet cake fan, but these would help me to reconsider. I topped these cuppies with my co-worker's white chocolate cream cheese frosting. I have been worn down. My client has worn me down. My manager has worn me down. Yes. They got me. Over some red velvet cupcakes. Let me tell you that ever since I started making cupcakes on a semi-regular basis, I have had to fend off requests for these particular cupcakes. I routinely made the mistake of asking people for flavor suggestions and then I would hear the list of usual suspects. Red velvet would always be on that list. And I would always veto this suggestion because *gasp* I don't like red velvet cupcakes. 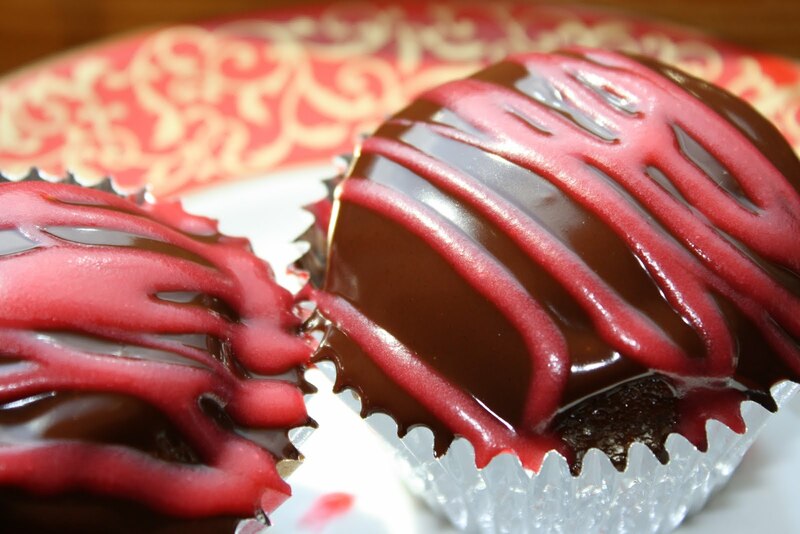 Somewhere in my distant past I had tried a red velvet cupcake and was turned off by it. So although I hadn't tried one in years I knew I didn't like it. And you can verify with any member of my family that I'm a stubborn one. If you try to get my to like something repeatedly, I'll put my foot down and claim instant dislike. I was able to fend off my client for the past year or two. I finally caved in when my client and my manager teamed up to bombard me with red velvet cupcake requests. I picked up a bottle of the "good stuff" several weeks ago. What, pray tell, is the "good stuff"? Spekuloos. It's a gingerbread spread that I picked up from the Wafels & Dinges food truck earlier this summer. It was a warm, gooey and spicy topping for a crispy, sweet waffle, so of course I devoured the whole thing. Then my friend Katie and I each took a jar of the "good stuff" home. I'm a little ashamed to admit that I didn't envision a cupcake right away. Then I happened to be checking out one of my favorite blogs, Cupcake Project. Stef had made peanut butter cookie dough that was safe to eat. I thought that was pretty interesting, but I didn't get inspired by the recipe until I saw her next post: peanut butter cookie dough frosting. I'm not particularly interested in making cookies. They're not my dessert of choice, though I rarely turn one down. But this frosting business sounded pretty tasty. I whipped out my jar of spekuloos in anticipation. I usually go to the gym on Friday nights. Given my propensity for consuming fairly large quantities of food and drink, heading to the gym on a regular basis is probably a good idea. Last week, it was my friend Kat's birthday so we decided we would pick up a few beers and toast to another year. Somewhere between the beginning of class and the end of class, "picking up a few beers" turned into "getting a Luke's Lobster Roll". How could I argue with that? We headed over to 7th St. and devoured Luke's lobster rolls like there would be no tomorrow. Yes, we made spectacles of ourselves. I asked for extra seasonings. Kat took pictures of me sniffing the seasonings which were stuck to my fingers after the lobster roll was inhaled. (Don't act like you don't do it too.) I may have badgered the nice guy at the counter to obtain the seasoning ingredients. OK, maybe I just made a spectacle of myself. Anyhow, at one point we noticed the Luke's guys were munching on some tasty cupcakes. Immediately, we demanded cupcakes from the unsuspecting workers. It turns out that these cupcakes were from Butter Lane, a cupcake bakery that was just down the street. Stomachs full of lobster, but still unable to pass up a cupcake opportunity, Kat and I headed to Butter Lane. I'm not going to get into all that Butter Lane has to offer. I think I need to do some more...um..."hands-on research" before I blog more about it. 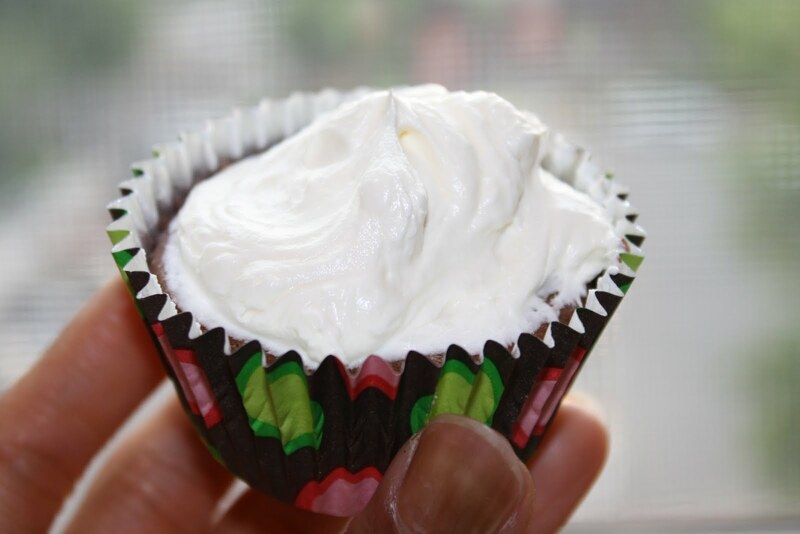 But essentially, you can customize your cupcakes by picking a cupcake base flavor and then choosing a frosting from their extensive list of specialty frostings. This is so much more than a cupcake shop. It's 500 square feet of heaven. So. What does this very very long story have to do with Sea Salted Caramel Cupcakes? My client's office happens to be pimped out with a full coffee bar on the first floor. This was a dangerous move on their part. Of course, I guess it makes sense to keep the worker bees fueled with caffeine. Recently, I've been ordering Almond Joy mochas from the aforementioned coffee bar. This was a creation I used to make when I worked at a coffeehouse in college. I didn't really have a name for the drink at that time. It was just this chocolate almond mocha thing into which I threw 4-6 shots of espresso. By the way, 6 shots of espresso in 1 drink is NOT advisable. Trust me. I've since toned down my radical pace of ingesting caffeine. Now I'm just a 2-shot kinda girl. Sometimes 3 if it's a particularly rough day. When I first requested for the barista to add a shot of almond flavoring to my large mocha, she said "Hey, it's an Almond Joy mocha!". And since then the name has stuck. So why have I just told you this story? 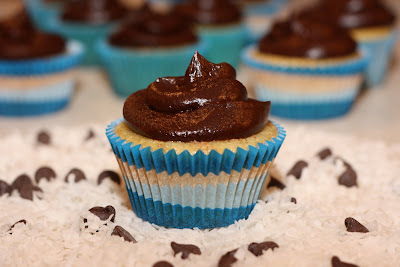 Because this was the inspiration for my Almond Joy Cupcakes! Duh. Voila, my first ever set of 4th of July cupcakes! I'm not American, but I can still show my American spirit. 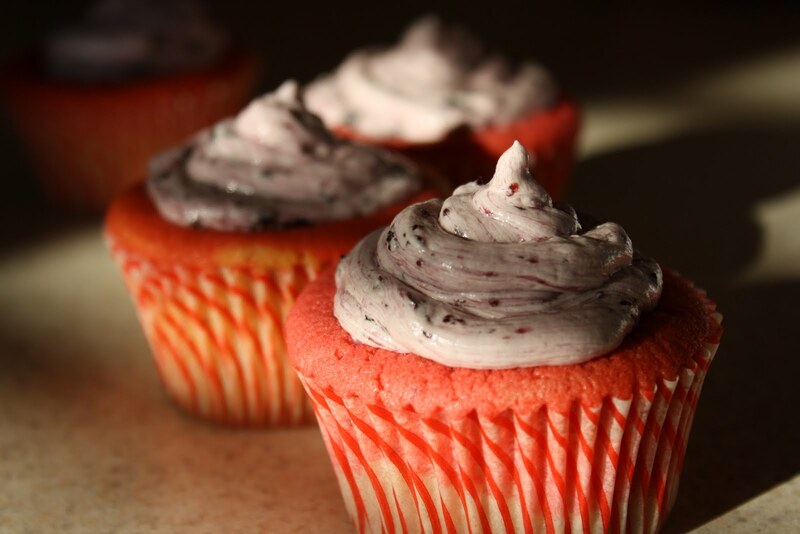 I decided that I would make a Red, White, and Blue cupcake in honor of the upcoming holiday! Since I don't like red velvet cake, I thought about what kind of red cupcake I wanted to make instead. Since it's strawberry season, I figured a strawberry cake would be pretty appropriate. The color could be helped along by a little red dye. And the frosting? Blueberry, of course, since they're just about in season as well. The white could be fudged by making a marble swirl pattern with the strawberry cake. Now let's cut to several hours later, when I realized that the cupcakes had kind of turned out to be Pink, Off-white, and Lavender . It's the thought that counts, right? I admit that a part of this cupcake's off-kilter color scheme was my fault, but practice makes perfect. At least I can tell you where I went wrong. I recently had a discussion with a coworker about the next type of cupcake I would make. After a few minutes, we stumbled upon the idea of a S'mores cupcake. Sure, why not? But how about a S'mores Cheesecake Cupcake? Uh-oh. Wait a minute. I had never made cheesecake before. There are all these horror stories out there about making cheesecake, so why did I just stuff my foot in my mouth and mention the dreaded "C" word? Of course, I could have cheated and baked a regular cake cupcake instead, making tweaks to keep it in the spirit of a S'more. But why not embrace the challenge? The first thing I thought of was the crust. A graham cracker crust would make the perfect base for this cupcake. Kudos to me for that cheesecake idea! Then of course, the chocolate cheesecake would follow. And then for the marshmallow part of the S'more. Hmmm...I do have that amazing Marshmallow Frosting that I used on my Chocolate Fluffernutter Cupcakes. That would be perfect! I finally set about making the cupcakes.